Two days ago, I decided that my trusty iPhone 3GS was beyond its usable life and it was time to upgrade to a 5. So off I go and upgrade my phone on the Carphone Warehouse website (which by the way were far cheaper than going directly to 02). Today I received a text message from Carphone Warehouse with the news I’d been waiting for: “Your order is on its way!” Great. And in the text message there’s a link to track my order. Brilliant. A nice bit of mobile CRM. Being a geek, I can’t hide the fact that I’m pretty excited about receiving my brand new iPhone 5. 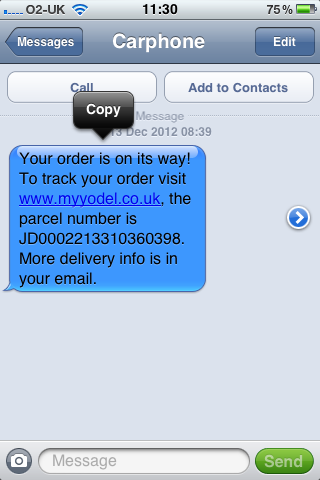 I’m keen to know whether it’s in transit, so I click on the URL in the text message to visit the parcel tracking website. But hang on a second. The tracking number is 18 characters long, and as hard as I try, my iPhone 3GS won’t let me copy that tracking code. I have to copy the whole message. Ah. Not so clever now. So I’m initially impressed with Carphone Warehouse’s responsiveness and the obvious use of mobile as a channel to communicate with me. But surely they should be aware of their faux pas? Do they realise I have to either write down that tracking number with a pen (painful), or memorise an 18 character tracking code (unlikely in my case), or switch to and fro between Safari and messages to enter it (very clunky). Surely they should have appended my tracking code to the URL, taking all the pain away? So I opt for the pen option. Ironically, I initially wrote the number down incorrectly causing another round of checking the tracking code. Finally I have the correct tracking code written down and I’m now looking at the parcel tracking website which has launched in Safari on my phone. 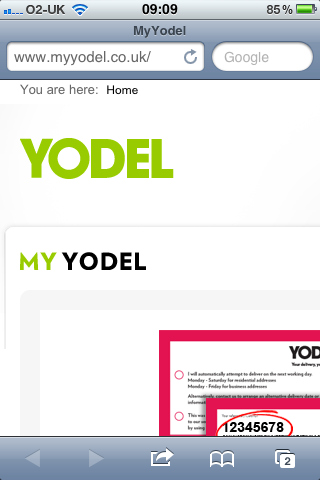 Oh dear, the website is designed for desktops and isn’t responsive. Surely not? How could Carphone Warehouse be directing mobile customers to a website for desktops? Ok, so with a bit of double tapping on the website, I eventually find my way to the input field to enter my tracking code. I type it in manually (grrrr) and then enter my post code. Oops. Postcode not recognised. What? And to make matters worse, I can’t initially see the error message, because when an error is encountered the web page reloads and takes me back to the (untapped) desktop version. This is getting tiresome. Three more attempts and I give up. It clearly doesn’t like my postcode. So I opt for plan B. I end up sitting in front of my MacBook Pro and within minutes I’ve found the information. 1. If you use text messaging as part of a mobile CRM strategy, make it usable. Pilot your system in a test environment and ensure that your text messages work across all devices. 2. If you’re landing mobile customers at a website, responsive design – content, layout and functionality – should be a forgone conclusion. 3. Mobile marketing has its unique challenges. Whilst your comms strategy may be spot on, rise every time to the unique technical challenges each channel presents. It’s 3.30pm and my iPhone 5 still hasn’t arrived…..